Proxy.sh have gone from strength to strength in the past few years. Apps for all major platforms. Token based login details available. Can be a little expensive. Proxy.sh burst onto the scene back in 2013 and have grown both in size and popularity ever since. The service offers something a little different to the rest of the competition available and concentrates on offering advanced encryption options not seen at most other providers. We’ve been taking a look at the service over the past few months to see if the encryption options are purely a gimmick or if the service offers something out of the ordinary. Proxy.sh works differently to many other providers out there in that there is a selection of packages. Usually providers offer 1 standard package only differing in subscription length but Proxy.sh have different packages available. Quick: The “Quick” package gives 72 hour access to the service which is great for accessing specific events such as sport or protecting your privacy for short periods. However, it’s pretty restricted in that only servers in the United States and Netherlands are available to connect to. Basic: Basic is similar to the Quick package although it’s a standard month account and offers access to servers in the USA, Netherlands, Germany, France and the UK. There is also an increased amount of servers available. 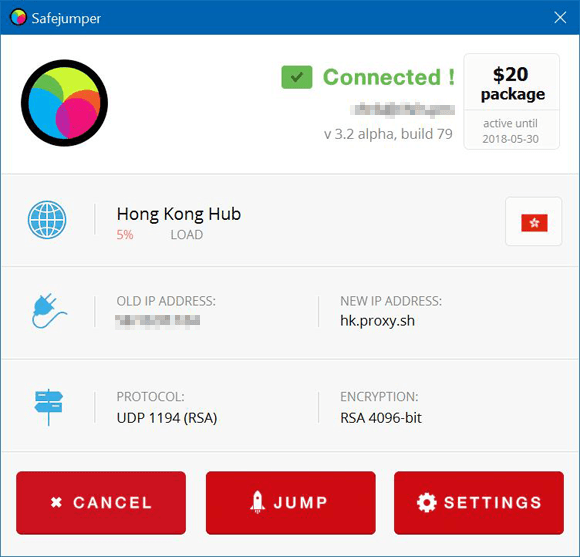 Solid: Solid is the equivalent of a standard package from most other providers and offers full access to the service which includes 57 VPN locations. Pro: The Pro package offers everything that the solid package offers. You also get access to a 50 GBps network over the standard 1 Gbps network although it is limited to 250 GB of transfer per month. You also get access to multi-hop servers. Proxy.sh also offers the ability to turn your account details into an anonymous hash which means they’ll no longer be able to identify your account giving you an additional layer of security. Proxy.sh offers apps and software for a range of systems. Like most providers they offer apps for Android and iOS mobile devices such as phones and tablets. They also offer software for desktop systems running Windows or Mac OS. Additionally, there is a Linux client which is a bit of a rarity in the VPN industry and definitely a bonus if you’re a Linux user. One feature we were really impressed with was the fact the source code is available for every client. If you’re so inclined it means you can compile it yourself or check out the inner workings to ensure your safety and privacy. It’s very rare for providers to offer such detail and should be seen as a huge plus for Proxy.sh in terms of transparency. We last reviewed Proxy.sh back in 2013 when they were nothing but a newcomer to the industry but since then they have changed beyond recognition. For the purpose of this review we’ve been testing both the Windows software and the Android app. Although we would class Proxy.sh as a provider suitable for more advanced users their Windows client is actually really user friendly and would be suitable even if you’re a beginner. The main screen deals with connection. By clicking on the country name or flag you’re able to select a different server. From here you can select between TCP and UDP and different ports. You can also select country and location hubs which will connect you to a server in that location. Strangely, certain locations and individual servers aren’t available to be selected directly within the software but instead you need to right click on the notification area icon. This seems a little bit odd and if you’re a new user you could overlook them. The upside is, using the software is incredibly easy. 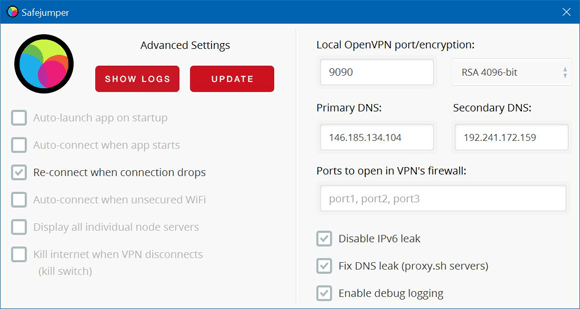 There is also a wealth of options in the settings area which includes security features such as Disable IPv6 leaks, Fix DNS Leaks and a Kill Switch should the connection drop. The Android app is essentially the little brother of the desktop client. Similar visually but with reduced features. Making connection works in much the same way as the desktop counterpart. Select a location hub, choose a protocol and port and make connection. Nothing complicated, just a few taps of the screen. Standard set-up offers up hubs to connect to which keeps things neat but means individual server locations are hidden away. These need to be enabled in the settings area and left us a little confused until we accidentally stumbled across them. Options similar to most mobile clients are a little thin on the ground but cover the necessary such as automatic reconnect and a kill switch. There’s also the usual plethora of options including the likes of launching the application on startup, and automatically connecting when it starts etc. The Android app isn’t the best we’ve seen nor is it the worst. The app can be a little unintuitive at times, such as the Android back button quits the app rather than moves back in the menus. Overall it’s easy to connect and has a few nice features, apart from that, nothing more to mention. Between our 2013 review and now Proxy.sh has expanded from offering just 28 different countries to more than 57 across the globe with more than 300 individual servers. The number of countries covered puts Proxy.sh at the higher-end of mid-range providers. The location spread is good and locations such as North America, Europe and Asia are well catered for. South America, Australia, South Africa and more are also covered. Due to the expansive network Proxy.sh is suitable for use in most corners of the world and if there isn’t a server directly in the country you’re in then there will usually be one nearby. Standout servers include Panama, Iceland, Switzerland, Macau and Hong Kong. Proxy.sh certainly has a lot of features that other providers don’t offer. The service claims to store no logs. They also claim to run everything in RAM which basically means if the server was reset everything would be lost. They were one of the first providers to start publishing transparency reports which detail each and every abuse or law enforcement request they receive. A warrant canary is also in operation which should alert users if any server interference has occurred. While Proxy.sh in many cases would be legally required to keep silent a warrant canary allows them to inform users in a round about way. The warrant canary has been triggered on at least one French VPN server so it’s important if you’re a user to keep regular checks if you want to avoid servers that may have been infiltrated by law enforcement. The service allows for 3 concurrent connections but they do state if the connections are from the same network then you can connect as many devices as you wish. For example, if you connected 10 devices on your home network that would be perfectly acceptable. You could still connect at another location and on a mobile network too to fill your limits. Proxy.sh are registered in the Seychelles which makes them an off-shore VPN provider and for some this brings added privacy protection. Like any VPN provider though you have to put an element of trust into the company running it. There are very few details about who is behind Proxy.sh and that is sometimes something they receive criticism for. However, that could be said for nearly any other VPN provider out there. Just because others are registered in the USA or UK doesn’t mean you have any added knowledge of the owners in most cases. Having used Proxy.sh for the past few months from various locations including the UK, Australia and Thailand the speeds achievable have been positive. For the purpose of the review we tested both the standard servers and the boost network and noticed no noticeable speed loss. We were able to connect on both a laptop and mobile device and stay connected without any interference on daily internet tasks. Having local servers certainly helped on the speed front. The boost network was where Proxy.sh certainly excelled. Upon connecting to a UK server from Thailand from another VPN provider we attempted to watch the UK TV service BBC iPlayer. The stream was plagued with buffering which also resulted in low quality. Upon switching to the Proxy.sh Boost server based in the UK we were able to stream BBC iPlayer live all the way from Thailand without an issue which just goes to show the difference it can make. It does however come at a premium price. Encryption is one area where Proxy.sh really come into their own. In terms of options they’re a provider that are pushing the boundaries not happy to rest on their laurels offering the basics that many others tend to. OpenVPN is available using the standard 256-bit AES with a 4096-bit RSA key plus other options such as the ability to use Tor, ECC or XOR options. There are very few providers offering such encryption choices and only VPN.ac and PrivateInternetAccess are two with similar options. Another area where Proxy.sh excel is their policies. Available areas of interest include a transparency report, warrant canary and network alerts. Support is offered via support ticket only but responses are generally quick. Proxy.sh tend to offer personal support rather than generic replies which gives the impression that those answering the questions actually know about the service and aren’t outsourced to some far flung location. We have always felt confident of a resolution to issues over the past 4 years of dealing with Proxy.sh. Sadly, however, there are no other methods of support contact. Overall Proxy.sh offers a very capable and reliable VPN service. There is a range of packages on offer which allow you to select the one most suitable for your needs. The standard comparable package to other providers is fractionally more expensive when taking an annual account but it should be remembered there are additional features not available from most other providers. Apps are available for all major platforms. We tested both their Windows and Android app and found them easy to use with no issues getting connected. A few minor points in the interface are a little unintuitive but overall there are no major issues. One area where Proxy.sh really shine is features. They have multiple encryption options that very few other providers offer and the service also has additional privacy features such as a warrant canary and transparency report that isn’t common across the industry. Speeds on the service are comparable with other top providers and the added boost servers are extremely useful although do come at a premium price so won’t be within the budget of many users. Overall we wouldn’t hesitate to recommend Proxy.sh, they have a good combination of features and server locations coupled with decent speeds. If you’re a techie you’ll appreciate the added security features and encryption options. Our verdict, give them a try!